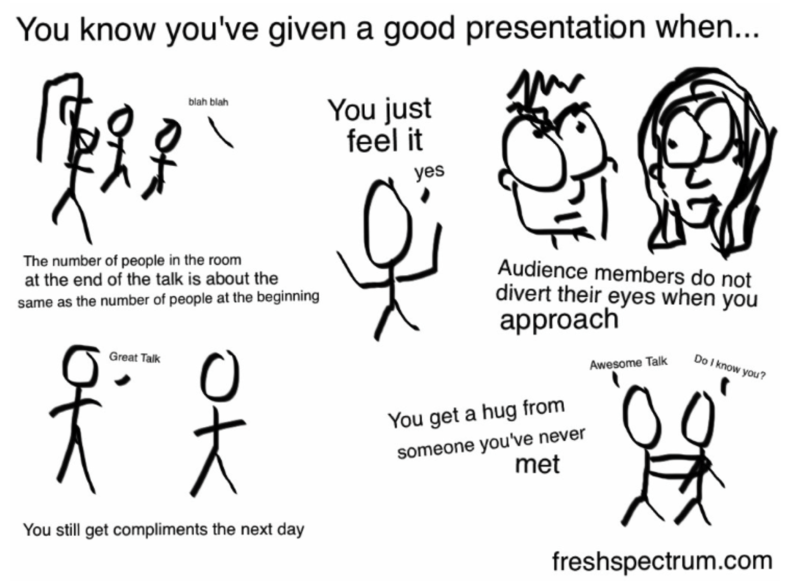 There are multiple pathways to great presentations. Some presenters are fortunate enough to be naturally possessed of stage presence, charisma, or a je ne sais quois that keeps their audience hanging on their every word. After all, Martin Luther King, Jr. didn’t use PowerPoint slides. * Steve Jobs never asked his audience to turn and talk to an elbow partner. The rest of us, though, are just not there. We’re presenting to the board, our colleagues, university students, fellow conference-goers, or some other audience who may or may not know us or be familiar with our work. “Star quality” is not something we can rely on for a successful presentation. What is an everyday presenter to do? Leverage the power of principles. You can find hundreds of books, articles, websites, and even courses on effective presentations with any number of strategies, recipes, steps, tips, tricks, hacks, or rules devoted to helping you design and deliver effective presentations. How do you choose what’s right for you? Rely on your principles. There are certainly any number of definitions for the word “principles,” but I’m framing them here as the synthesis of fundamental rules and values that guide our decisions and actions. As such, principles are descriptive, rather than prescriptive. Principles can be shared in common with others, but in practice, may look quite different from presenter to presenter when applied. You and I could each be guided by the principle that audience engagement is necessary for effective presentations, but we will likely go about applying this principle in very different ways. Under principles we can certainly suggest strategies, models, formulas, or step-by-step plans for adhering to them, but these do not need to be applied assiduously in a “take as directed” sort of way. The broad principles we choose guide our work and our decisions about how to use suggested strategies. What principles might guide presentation work? The American Evaluation Association’s Potent Presentations (p2i) Initiative rests on the principle that the way in which you structure your message, design your presentation, and deliver it are key elements to success. What key presentation principle guides my work? I’m a career educator who has taught everything from algebra to piano lessons, and my number one guiding principle is this: All presentations are lessons and all presenters are teachers. This principle guides my thinking as I develop presentations with participants’ needs in mind: what do they need to know, understand, or be able to do as a result of attending my presentation? Look for upcoming blog posts on presentation principles, along with ideas, strategies, and steps you can apply in your own ways as you are guided by your presentation principles. *Thanks to Jon Schwabish for that gem!